No one wants to swim in a stinky, polluted, algae-filled lake, but keeping our lakes clean and ecologically diverse is not an easy task, a point that Citizen Science might work harder to bring home. Citizen Science is an educational game produced by Filament Games in conjunction with the esteemed Games+Learning+Society institute at University of Wisconsin-Madison. 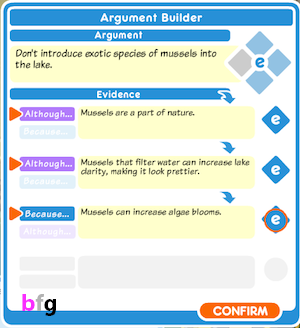 The game's central premise is to teach players about both the basics of lake ecology, while also helping them understand scientific reasoning and how facts can be used to formulate persuasive arguments. It's therefore more than just a game about helping players understand the ways in which human activities can effect lakes over time, it's also about helping kids understand how scientific practices have real-word implications. To achieve that end, the game puts the player in the role of a seemingly average kid who turns out to have an extraordinary gift for persuasion. 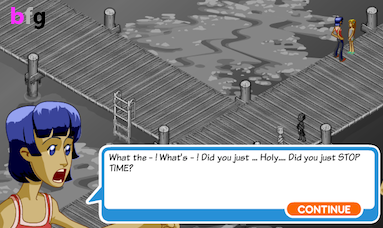 Because of this gift, supernatural characters in the game describe the player as "the Steward of the Lake," aka, the chosen one who is prophesied to save the lake. But saving the lake requires more than just a gilded tongue--you also need to travel through time. Good thing there are Lake Spirits with magical powers to help you out. I don't recall Lake Spirits and time travel coming up in science class. Citizen Science is a smartly crafted game that works hard to make learning about lake ecology both an adventuresome and empowering experience. But it's also a game that feels somewhat divided against itself, one the one hand emphasizing the importance of scientific research and public education to the long-term health of our environment, and on the other having to fabricate a magical, other-worldly scenario in order to make all that science work seem exciting. Although it is clearly not the intention, it still sends the less-than-ideal message, "Magic is fun, science is work." The magical interventions drive the game's plot, which was an unfortunate decision, in my opinion. The result is that the plot ends up feeling forced and oddly contrived, so much so that I found myself more than a little annoyed with the story by the end of the game. Perhaps younger audiences might find the game's fantastical elements entertaining, but the game requires a lot of reading--so much so that younger players might understandably struggle to understand all of the game's content. Yet, more mature players who can easily handle the reading could easily find the magical story line a little too outlandish and childish. Of course, Citizen Science isn't necessarily trying to win any storywriting awards--the true heart and soul of the game lies in trying to promote a deeper understanding of lake ecology specifically, and scientific inquiry and logic more generally. To those ends, the game also has an accompanying resource sheet for teachers outlining the game's various learning goals and how they align with teaching standards. 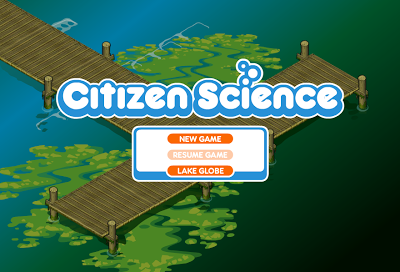 Citizen Science has two primary interfaces that players have to master: the first is the basic point-and-click town navigation screen, and the second is an interface for constructing logical arguments with townspeople and other game characters in order to persuade them to help you in your goals. The standard point-and-click adventure method of getting around Lake Mendota and other familiar Madison environs, makes sense in this type of game and is easy enough for even fairly young children should be able to handle, but it also gets old rather fast. Too much of the "challenge" of this game comes from running back and forth across screens. Go here, talk to this person, go there, talk to that person, go back to person #1, now do it all again in a different time period, etc., etc. All the running and clicking on things stretches the length of time players spend with the game, but in most cases not very meaningfully. The other primary mechanic in the game is the argument construction. As mentioned above, your character is sent on the quest to save the lake because of his/her reasoning abilities and verbal eloquence. 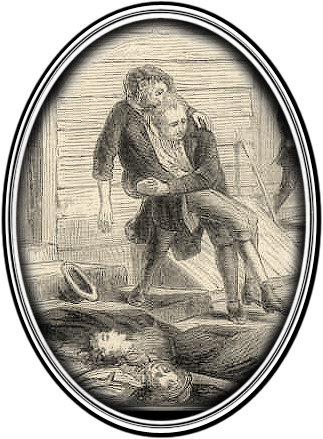 This is enacted in the game by players collecting tidbits of information, which they must then selectively use to construct persuasive arguments to different audiences. It's a nice device for making players more active in the acquisition of their knowledge. It's not enough to simply read the dialog about how certain environmental factors impact the overall health of the lake, you have to actually employ that knowledge to persuade others to share your opinion. However much I like the idea of having an argument component to the game, in the end I found this to be a mechanic that works a bit better in theory than in practice. The logic which players must select in order to make their arguments is noticeably superficial: you really only have to decide whether the fact supports your position or contradicts it, which players signify by choosing the keywords "because" or "although" when they are making their argument. Again, younger players might find this to be just the right level of challenge for them, but I think more ambitious players could easily be frustrated by this overly simplistic approach to what amounts as a persuasive and rational argument. Another problem with the argument process was that selecting the appropriate facts to use in an argument with a character was not particularly self-evident, and the argument construction part of the game had more in common with taking a test with a perversely long multiple choice question than it did with constructing a persuasive argument. There simply was no obvious reason why certain facts couldn't be used persuasively on multiple characters, but the game rarely gives players the option to reuse key points. This means that selecting facts mostly becomes a process of elimination, and more than once I found myself figuring out what facts I was expected to use based solely on the order in which the game unlocked my access to those particular facts. Because of these weaknesses, the novelty of the argument mechanic quickly wears off, and I suspect many players will feel less like "the chosen one" and more like some kind of perverse spam-bot: "I see you are interested in cats. Please allow me to now tell you all the cat facts I know..." Of course, I realize that from the standpoint of artificial intelligence, creating a sophisticated argument analysis algorithm for this game would have be well-nigh impossible, but I dare say the disappointment here lies in expectation that the argument construction would involve some non-trivial amount of depth and sophistication. Citizen Science shines when it comes to packing in a lot of good information about lake ecology and how humans can impact the health of lakes. Players will learn about key concepts like eutrophication and how that can lead to dangerous algal blooms, as well as gain an understanding of how such processes effect and are effected by various different stakeholders and interest groups, ranging from kids who just wants to swim in the lake, to farmers, fishermen, developers, neighboring landowners, political leaders, and even cattail-loving muskrats. Trust in the magical crystal ball of eco-variables. The muskrat wouldn't lie. But while the game excels at making players aware of the social and economic components that impact the successful management of lake ecologies, it is less successful in how it engages with all the complexities it introduces. Every obstacle in the game is overcome either by magical time traveling or by a simple "although x is true, you need to change your practices because of y fact" type of arguments. Well, here is my response to that: although it is fair to simplify complex problems for pedagogical purposes, it's bad teach kids that magical thinking will solve our environmental problems because we don't live in a magical world like Hogwarts. Sure, if we all had time traveling abilities, perfect knowledge or the world, and persuasion was as easy as snapping Legos together, the world could be an idyllic place. But that's hardly the case. One of the game's developers, UW-Madison Professor Kurt Squire, has spoken about how one of the goals of Citizen Science was to present kids (or anyone) with the tools they need to shape the real world. He wanted players to feel empowered by those tools and to believe that effecting change in the real world was just as doable as effecting change in the game world. 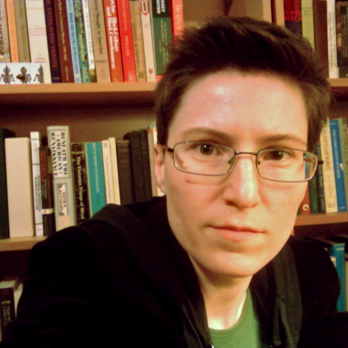 But if knowledge provides the power to make real change, then the process of how knowledge is created shouldn't be portrayed as being as inscrutable as divination, and yet, Citizen Science does exactly that. Citizen Science seems to make the tools by which we understand complex ecosystems and effect change look like things of magic themselves. Players in the game act less on the basis of reasoned decisions, and more on faith in the demands of the Lake Spirit. 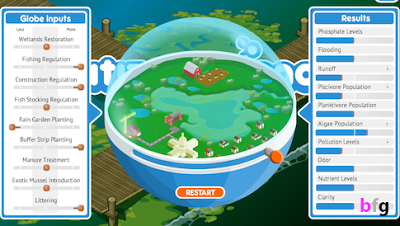 All of the "facts" that players use in the game to persuade others to change their behavior are produced in a very literal black box: a magical snow-globe / lake-simulator. this gives players the illusion that there is nothing fraught or complicated about water rights and land-use management, and yet, if water management policies and practices were non-contentious and as easily implemented as the game suggests, it would be hard to understand why we have any lake or water ecology problems at all. Once again, I think the decision to make the plot of the game so deeply rooted in fantasy ultimately betrays the game's pedagogical goals. While it is true that no individual has the time or tools to verify every fact that he or she may encounter over the course of a lifetime, it is disturbingly ironic for a game that is about combatting misinformation and ignorance to encourage players to adopt a stance of uncritical acceptance of knowledge, and particularly of knowledge derived from mystical sources. Citizen Science does a better job than most educational games in delivering a true game-like experience to players along with a pretty nuanced and robust understanding of how lake ecologies are impacted by human behaviors. I would definitely say that students in an environmental science class could enjoy this game as a compliment to their traditional lessons, and younger players could get a solid introduction to lake ecology from this game. But it is unfortunately a game that I think has limited entertainment and pedagogical value. Although the game takes roughly 15-30 minutes to play, the challenge never really increase over the course of the game. In terms of game mechanics alone, there simply isn't a lot of depth: go here, click there, go back to where you were, click some more. It doesn't take a full 15 minutes for this to become a rather dull exercise. Similar point-and-click style games like the old King's Quest series, Monkey Island, or Maniac Mansion were engaging largely because of their impressive (and somewhat frustrating) non-linearity. Sure, there were areas that you could not access until you solved certain puzzles, but you had a certain freedom to explore the world, and to make mistakes in figuring out how to solve puzzles. Citizen Science may be more kid-friendly in the sense that you cannot really fail at any of the tasks the game present, but this means players lose the freedom that makes adventure games adventurous. Players simply aren't really in control of their played experience, which makes Citizen Science more likely to test the player's patience rather than excite their interest and imagination. Science fact and science fiction lead an uncomfortable coexistence in Citizen Science. And yet, the developers themselves seem to have possessed an overabundance of imagination in writing Citizen Science. Why, in a game about science, players must rely on Lake Spirits is a fairly baffling conceit, although perhaps more baffling is why the Lake Spirits in the game must rely on humans and the power of science to save the lake when they can speak with animals and time travel. But the most frustrating effect that this convoluted plot has on the game is the insistence that players willingly rely on an overabundance of magically-produced knowledge. One can easily imagine why a magic, all-knowing snowglobe might seem more fun than say a textbook, but the production of scientific knowledge ought not be presented to children as being on par with mysticism. Scientists don't scry their knowledge from crystal balls, and neither should todays's aspiring citizen scientists.